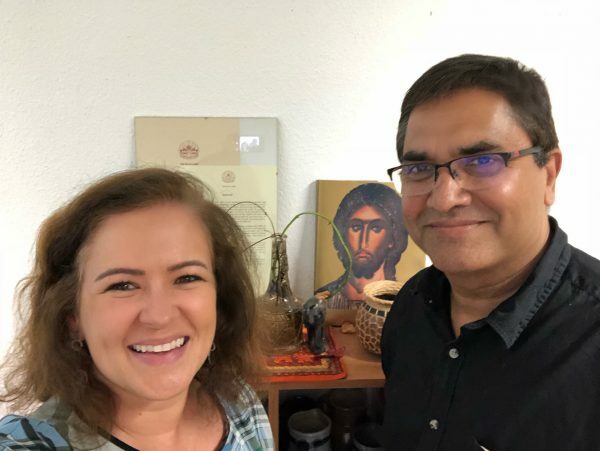 While interning in Geneva, Switzerland, I reached out to the World Council of Churches to interview them about their work with the 2030 Agenda. On the same day, I got an appointment with the person in charge of it at the council. Dr. Manoj Kurian is a Malaysian physician with Indian origins. The first time Dr. Kurian joined the World Council of Churches (WCC) was in 1999. He was called to direct the Health and Healing program. After 13 years, he left the WCC to work for the International AIDS Society, where he was responsible for their Policy and Advocacy work. He came back to the WCC a few years ago to be the Coordinator of the WCC-Ecumenical Advocacy Alliance. He started our talk explaining the etymology of the word oikoumene, which comes from Greek, meaning to inhabit in the world. Therefore, economy and ecology also derive from the Greek word oikos and indicating global scope. The WCC is a non-profit organization that works more like a fellowship of 350 churches, which believes in the Trinity and that Jesus Christ is the Messiah. The historical roots of the WCC are found in student and lay movements of the 19th century, the 1910 Edinburgh world missionary conference, and a 1920 encyclical from the Orthodox Synod of Constantinople suggesting a fellowship of churches similar to the United Nations. Leaders representing more than 100 churches voted in 1937 to found a WCC. However, its inauguration was delayed because of the outbreak of World War II. One of Dr. Kurian’s jobs is to advocate for the Sustainable Development Goals (SDGs) amongst the WCC members across the globe. He is passionate about his career. He shared with me some passages from the Bible in which advocacy is mentioned such as Proverbs 31:8, Micah 6:8, Isaiah 1:17. Dr. Kurian’s answers and comments are personal opinions and do not represent his current or prior employers. How can religion and religious groups such as pastorals, and other communities contribute to help the United Nations member states achieve the Sustainable Development Goals? All churches already contribute to the SDGs and the 2030 Agenda. Churches are involved in societies doing charities and development work. The churches only need to use the UN framework to make their services more relevant to the SDGs’ achievement. What has the WCC done so far to spread knowledge about the United Nations Sustainable Development Goals to the affiliated churches? Since September 2015 when the 2030 Agenda was announced, the WCC has been advocating for the SDGs. Religious communities can play a critical role by popularizing the SDGs and engaging their members in prayer and action. Christians, being among the largest faith communities, can exercise significant influence. Specifically for SDG 6 – Clean Water, the WCC created the Ecumenical Water Network (WCC-EWN) which was one of the speakers at the High-Level Political Forum (HLPF) in the UN headquarters in New York City last July. The WCC-EWN promotes the preservation, responsible management and the equitable distribution of water for all, based on the understanding that water is a gift of God and a fundamental human right. Other current WCC programs include a Decade to Overcome Violence, an international campaign to combat AIDS/HIV in Africa and the Justice, Peace, and Creation initiative. What are the SDGs that the WCC is more prone to tackle? The WCC works other religious groups such as the ACT Alliance, the Anglican Alliance, Caritas Internationalis, Globethics, Lutheran World Federation, to collaboratively discuss and engage in advocacy and action for the SDGs. The WCC and these groups try to identify critical global processes and issues where the work of Christian-based organizations is relevant and discern the best way to promote coordinated strategic actions to support the work of organizations – individually and collectively – around specific processes and issues. However, the SDGs are being tackled locally according to the needs of each area. What is the importance of religion in today’s world? Religion is just like a rope; it can be used to hang someone or to pull water out of a well, it can serve to help or harm someone. The many churches around the world are merely denominations. The primary purpose of the WCC is to work on the commonalities of those denominations. The WCC aims to pursue the goal of the visible unity of the Church which involves a process of renewal and change in which member churches pray, worship, discuss and work together. Today, the role of religion is vital to the peace process around the world. This article was written by Patricia Zanini Graca, a second-year graduate student at Seton Hall’s School of Diplomacy and International Relations. Patricia is the Executive Editor at the Journal of Diplomacy, UN Digital Representative at the Center for UN and Global Governance Studies, Abd El-Kader Student Fellow and Director of International Affairs at the Graduate Diplomacy Council. She specializes in International Organizations and Global Negotiations & Conflict Management. Her interests are human rights, gender equality, and corporate social responsibility. Thank you, Sandro Breda, I am glad you liked it. I agree!! Very good interview! Congrats Paty.